I ran into my buddy Scott at the movies last night. Scott's been at the heart of the music scene here in Portland for the better part of ten years and has seen the ups and downs. We agreed we're finally seeing an "up" again -- everyone who was trying to "make it" left for LA or wherever, the phony venues and show bookers trying to make a quick buck have dissipated, and those of us remaining are all in it for the sake of it. And the music is really good again. 'cause we're all friends, cause we go to each other's shows, cause we lend each other microphones and recording equipment, cause we see each other at the practice space and hear each other through the thin walls, cause all day at work we talk about what songs should go on each others albums, what shows we need to book, and what's happening this weekend. Landlines' music is centered on Dustin Scharlach's honest, off-the-cuff songwriting, which ranges topics from counting tips to house shows to the daily horoscope without fuss or affectation. Similarly, his guitar playing is both loose and "classic," alternately evoking the clean, chiming lines of Television or messy New Zealand noise-pop. Behind him the rhythm section plays with upbeat restraint, but not without the occational sideways drum beat or nimble turnaround. These songs are refreshingly straightforward, hiding nothing behind guitar effects or persona. They are not jaded nor cynical, their openness a subtle challenge to the listener -- you can choose to relate or risk hard-heartedness. 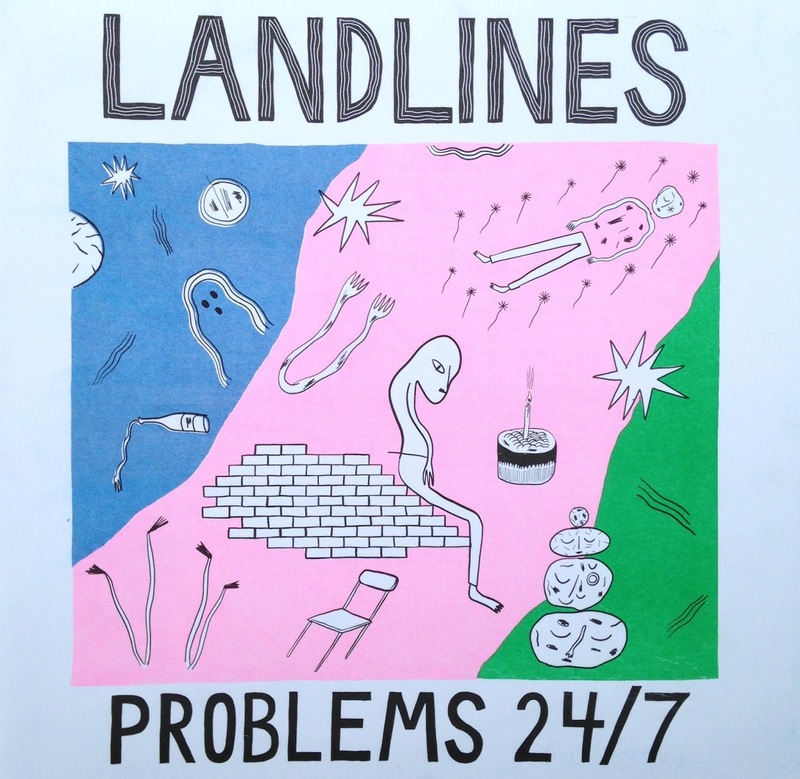 Problems 24/7 was recorded at Dub Narcotic Studio in Olympia and mixed by Greg Saunier of Deerhoof.